Dining at Erawan is always a grand treat. This is chiefly due to Chef Korn's exquisite touch to all his dishes including these new ones he premiered recently one Sunday. In addition, steadfast favourites such as the cockle curry, grilled scallops with Thai style salad, salmon sashimi, Panaeng beef curry and a lamb version of their massaman curry were also served. Lunch started out with some fusion items. Pad Thai was given a new form, as a croissant sandwich. Instead of noodles, the prawns, beansprouts with a sweet sauce was served in an easy to eat-and-go style sandwich. Rather perfect for a midnight snack, as I write this with my belly rumbling away. 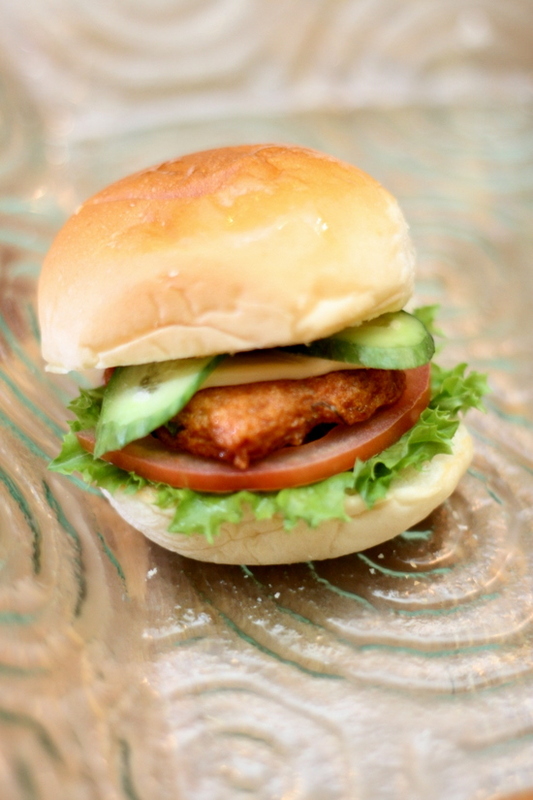 Another perfect to go item was the Thai fishcake burger. Served with a tangy plum sauce, the pan-fried fish cake with kaffir lime leaves was paired with sliced cucumbers, cheese, tomatoes and lettuce. 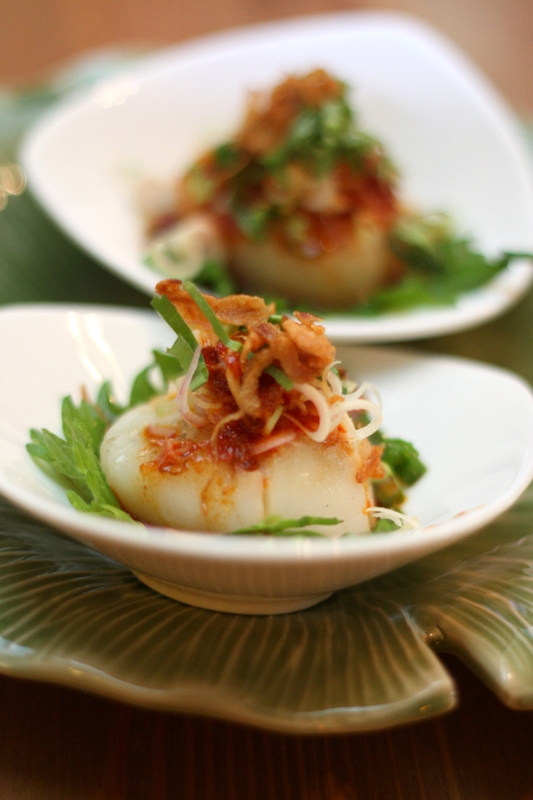 Intermingling with the new items were also some regular dishes such as the plump juicy grilled scallops topped with a tangy refreshing Thai salad of fried shallots, lemongrass and kaffir lime (RM60). Another regular was the mieng kam served with daun kadok leaves, roast duck and pomelo. We also enjoyed the salmon sashimi salad (RM58 for 200g salmon sashimi) that was served on these slightly bitter tasting endive leaves that had a lovely crunchy texture. 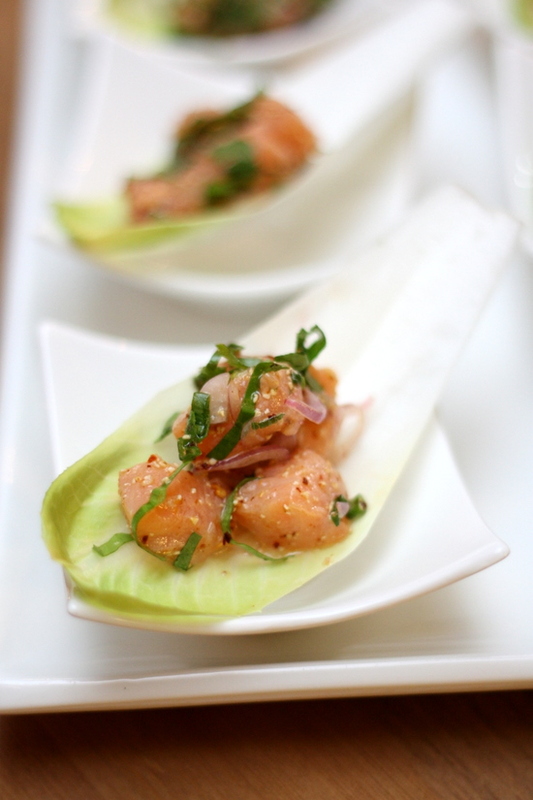 The cubed salmon was tossed in a spicy dressing made from ground roasted rice, lime and chillies. One of my big favourites was the lemongrass prawns. 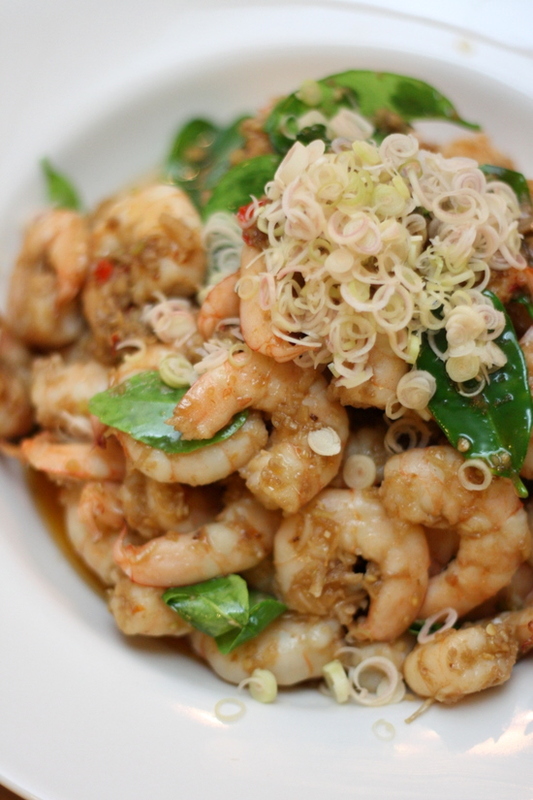 Each juicy and crunchy prawn was tossed in this slightly sweet sauce with minced garlic and topped with lemongrass. I shamelessly had quite a few helpings of this dish. There were loads more such as various curries mingling with a magnificent looking deep fried flying fish. A lamb massaman curry with potatoes was excellent and we even sampled a new curry, a Northern beef version with nuts known as Pang Hang Lay. One of the dishes is a new item known as chicken and spices curry (RM48) already introduced since this September, a mild chicken curry cooked to an old recipe using lots of spices such as cinnamon, mace, nutmeg, caraway seed, cloves, cardamom and coriander seed. This is served with sweet green chilli peppers. As a treat, there was even Thai Laksa. 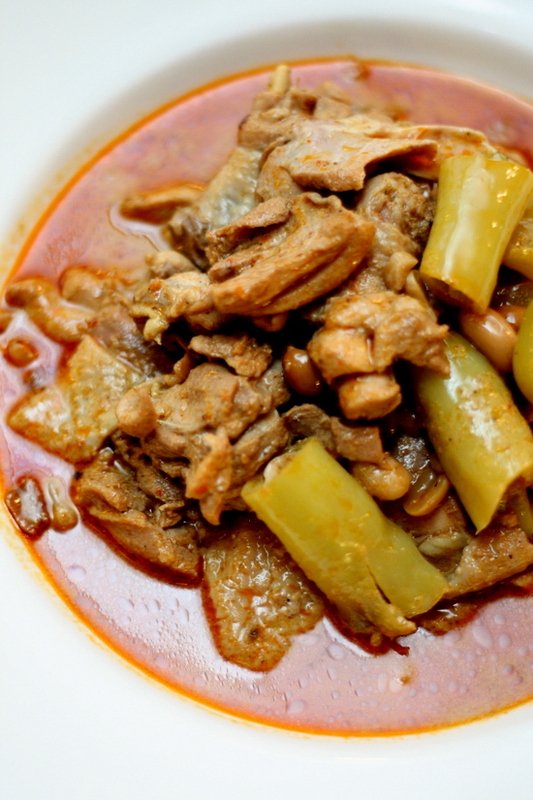 Two versions were made - the rich creamy one and a tangy tamarind based broth with fish chunks. 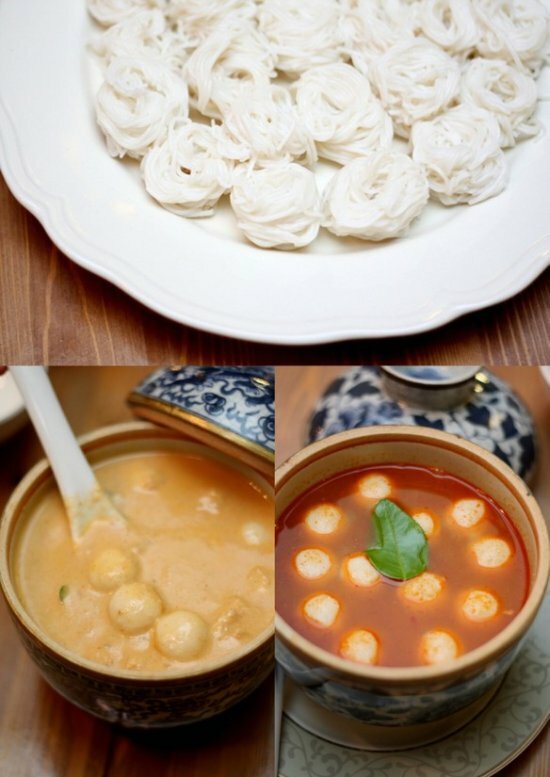 Both were served with fishballs and the traditional rice noodles. Both were equally good that I had a hard time choosing which one to have seconds. Another great dish was the roast duck served with crispy fried Thai basil leaves. Love the juicy pieces of roast duck breast that goes well with the aromatic basil leaves. 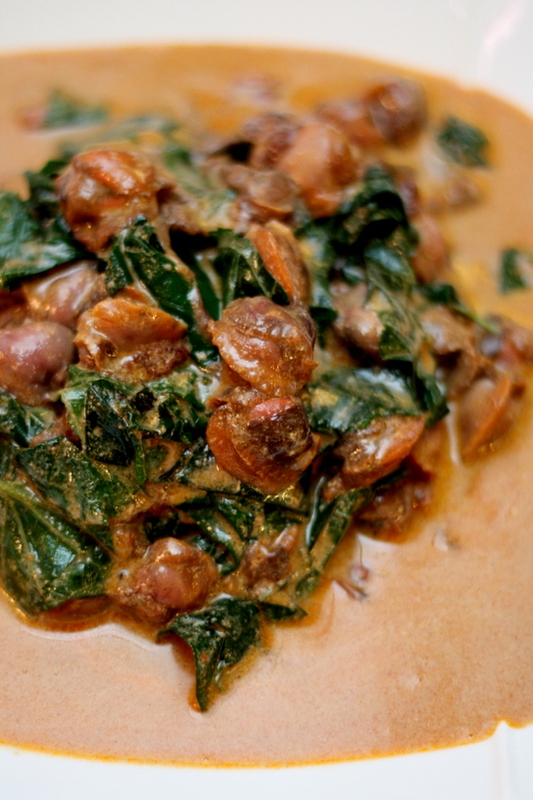 One of my all-time favourites is the cockle curry (RM38) served with daun kadok or betel leaves. Erawan prides themselves for serving premium cockles - large juicy ones - cooked to perfection unlike those rubbery cooked-to-death specimens we get in char kuey teow. We don't stop at appetizers and mains as there are sweets to nibble on such as exquisitely shaped Lup Chup - tiny fruit shaped desserts with a mungbean filling. There's loads to choose from - papayas, bananas, grapes, apples and etc. Also on hand were these irrestible crunchy deep-fried puffs (like those peanut puffs we get for Chinese New Year) except these ones had a savoury filling made from dried shrimp. 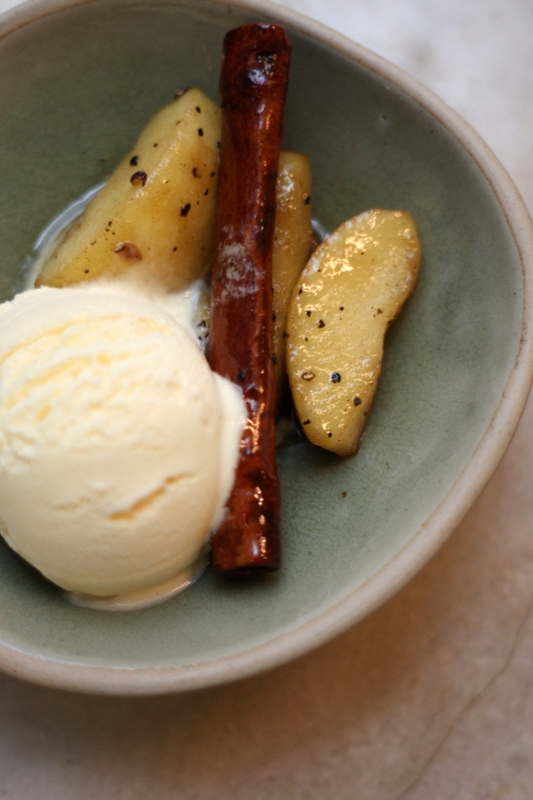 Last but not least, we ended with a cold treat - vanilla ice cream served with apples spiced up with cinnamon, star anise and Sarawak black pepper. The apples still have a soft bite to them. Really lovely end to a wonderful lunch. All the extra menu items here can be ordered ahead. 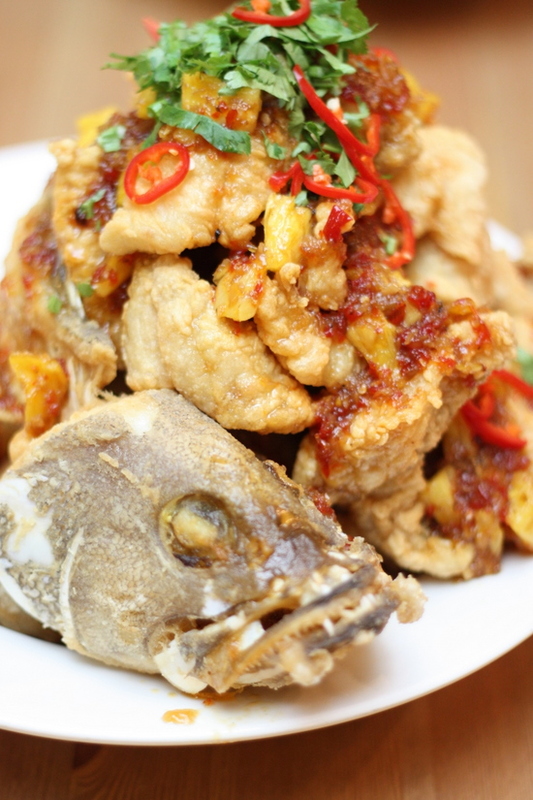 Abide by Erawan's pre-ordering rule and you will have a great feast waiting for you. More pictures are in the Flickr collection. *This meal was an invited one. Wait, wait. 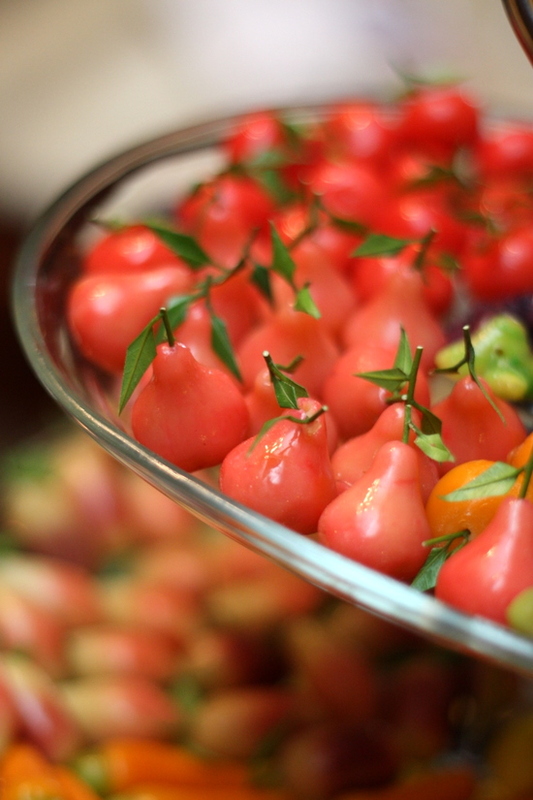 Those little water apple-shaped things are not actual fruits? wow. I've eaten at Erawan a couple of times and both times come away impressed with the quality of the food. His accolades are well-deserved. That Lemongrass prawn looks dope! 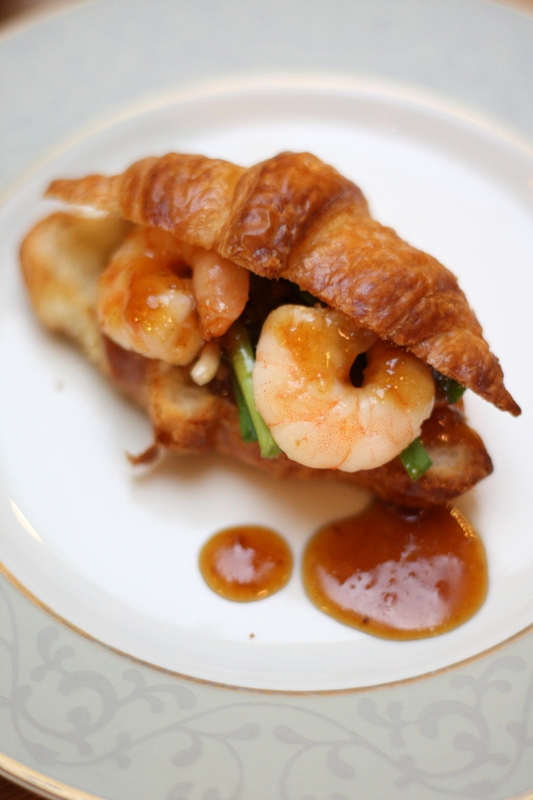 And love the whimsical Pad Thai croissant. Who would have thought of putting something like that together? lup chup! i used to have the carrot and capsicum shaped ones! <3 <3 sigh... the memories! i am not loving the idea of pad thai in a croissant. too fusion. but how that cockle curry calls out to me! So gorgeous! Came home ill from work with no appetite and as soon as I launched this post, I was instantly hungry! And cured! Such be the powers of Erawan! Cockles! With hun-kalok (Daun Kadok in Hokkien) Nice! Must go there with Mom one day, I think she will love this place. this is my favourite restaurant too. too bad i was in singapore or else i would be able to meet you there! I have yet to visit! OMG.. that's long overdue! Ok ok..gonna bump this up my list! Thai Food must be very spicy one if not no taste.. SWT alot is the best way to consume THAI food!